Quentin Taratino is a great filmmaker. The guy makes movies that are pretty much instant classics. Inglorious Basterds is certainly not an exception having been nominated for eight Academy Awards. Like most movies of his that I’ve seen I was instantly drawn in the first time I watched it, and I’ve re-watched it several times since. I like that Inglorious Basterds is set during WWII but still has a stylish modern feel to it. I can’t say enough about the casting and I dig all the all of the moments of dark humor that perfectly balance the wartime subject matter. I started this set as just a one carder. I was thinking of characters that used baseball bats but not for the purpose of playing baseball, two of which (Al Capone and Negan) I posted about recently. Another that quickly came to mind was Sgt. Donny Donowitz aka “The Bear Jew”. I was so happy with that card I immediately knew I was going to make his Basterds teammates. Since Inglorious Basterds is a newer film I gave myself carte blanche when it came to the design. For one reason or another I thought a 1990 Topps baseball inspired design would work out well, and I wasn’t disappointed with the results. 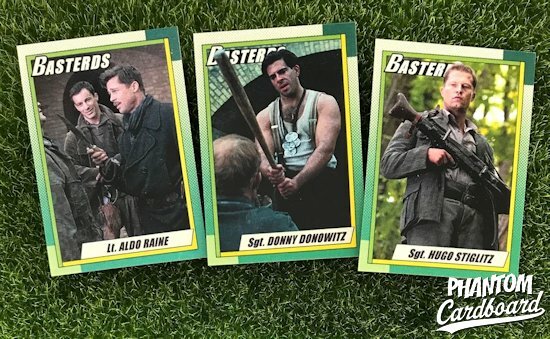 There were a couple other members of the Basterds that were present during the first Nazi massacre scene, but that was about it and they didn't have any significant lines or moments otherwise so I didn’t make cards of them, but the rest of team is accounted for.